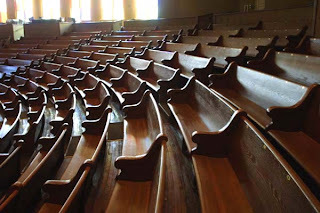 Since moving to Nashville, I had already started thinking about my first visit to the Ryman Auditorium. I knew that I wanted it to be a spectacular experience. I wanted it to be a show that I personally felt was worthy of entering this historic and beautiful building. I wanted to have the "sublime experience." I thought Conor Oberst and his new band would be perfect, but due to scheduling conflicts I was unable. When I found out that The Hold Steady would be playing on Halloween night- I knew this was the perfect event. It would create the exact experience I wanted to have inside the auditorium. 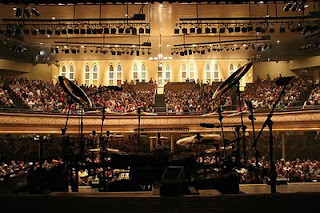 But in the most unexpected way- I ended up the Ryman this last week for an impromptu show. After a couple of drinks one night, I discovered that the one and only Dancing Outlaw would be opening for The Black Keys. Upon this information, I purchased two tickets within a couple of minutes. Finding out that for the first time and perhaps the only time in my life, I'd have the opportunity to see Jesco White perform, I knew I had better be there. If you don't know about the cult legend that is Jesco White- take some time in the privacy of your own home to do a search. There are plenty of videos from the 1991 documentary, Dancing Outlaw online, if you so desire. Perhaps I should preface this entry by saying that I first saw this documentary when I was about 19 years old. At the time, it was one of the most hilarious pieces of cinematic documentation I had ever viewed. Now in retrospect, I realize not only that I have different feelings about Jesco, but that also the most hilarious thing I've ever seen is the television show, Words of Deliverance. Regardless, now when I go back to view the footage of Jesco White, I find myself ambivalent. I feel voyeuristic. I feel embarrassed. Regardless, I still wasn't going to miss a chance to see him perform. So, it wasn't my picture perfect idea of my first show at the Ryman, but it would have to do. I was immediately in awe of the Ryman upon entering. I plan to see as many shows at this venue as possible during my time in Nashville. It was rather spectacular and quite comfortable- though I wish I could say the same about some of the others in attendance. Jesco performed in the middle, right before The Black Keys started. Apparently, he had been enjoying a bit of the sauce before waltzing on stage. Upon his appearance, he stripped off his shirt and began making all types of gestures (such as milking himself, smoking pot, and masturbating), while half tap-dancing and half-talking to the people in the first few rows. It was funny at first. Even his sister, Mamie, was there. It was shortly into his first couple of songs(?) and it seemed that the moment of complete and utter drunkenness was upon him. I also noticed that there were equal parts of folks at the show that knew of his legendary status and equal parts of folks who felt this "performance" was the most ridiculous experience of their young, privileged lives. I only know this affirmatively after an altercation with a loud-talker that was right behind me. Had I paid better attention, I should have picked up on the name of the couple that he and his friends were so loudly talking trash about, so I could feel a sense of justice by outing them. By the end of the performance, when Jesco was almost literally dragged off stage by Mamie...I started feeling uncomfortable. He fell down on stage. People laughed. People clapped. I found out shortly afterwards, he was kicked out of the Ryman (perhaps it was a rite of passage for him?) The more I think about it, I wonder about the thin line between a form of entertainment and a voyeuristic train wreck. I wondered what The Black Keys expected to happen when this booking? I wondered what it was that I really thought would happen when I bought the tickets? Was I expecting this display of humiliation? Did I think he would just come out tap-dance and spew some of his incredibly odd translations on the philosophy of life? I'm not sure. And perhaps that is what makes me truly uncomfortable. I plan to rectify this Ryman experience in a few short weeks with The Hold Steady show. I pray that Craig Finn doesn't do anything that makes me feel odd.